Dubbed the 'Great Minnesota Get-Together', the Minnesota State Fair is eagerly anticipated by locals every year, taking advantage of the beautiful late-summer weather to attract millions of people for food, music, rides, exhibitions and more fun. 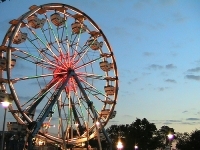 The Midway offers dozens of rides and games for all ages, while the livestock competitions offer farmers the chance to show off their prized animals. The Fair started out as an event for farmers, so there are still machinery shows, but that has become secondary for most people with the concerts, exhibits, and shows. The real attraction is the food though, with Sweet Martha's Cookies, all-you-can-drink chocolate milk, Bloomin' Onions, and an amazing variety of food fried on a stick ranging from alligator to spaghetti and meatballs to cappuccinos.